While I have been hesitant to invest in a pizza stone, I have noticed a significant difference in the quality of the pizzas I bake on a baking sheet compared to those I bake on a pizza pan. Getting a crispy bottom crust seems much more a matter of luck when using a baking sheet than with the pan, and additionally the pan is the only surface I’ll trust to bake a pizza with any thickness to it. In response to my last post about pizza, one of my friends pointed me to an excellent blog called Slice, which has experimented with all kinds of cooking techniques, surfaces, temperatures, fermentation techniques, dough recipes, yadda yadda yadda. Most of their experiments can be found in the aptly title Pizza Lab section. I found myself reading about pizza until about 2:30 am that night, which I think is just about the highest recommendation I can give that blog. Pizza Lab has put out several articles about cast iron pans and skillets. Not all of their experiences have been positive. Nonetheless, the results have enticed me into giving things a try. Cast iron is an attractive surface because it can’t crack like a stone, and is comparable in price or even cheaper than similar quality stones. For the purposes of this experiment, I decided to make “basic” Neapolitan-esque pizzas topped with just mozzarella, basil, and sauce to get a baseline on the technique. I additionally decided to go with a recipe for the dough and sauce that wasn’t of my own make (my recipes can be found in my last pizza post). For the sauce I followed Slice’s NY style pizza sauce recipe. For the dough I followed a very simple recipe: 4 cups bread flour, 1.5 cups + 2 tbps water, 1 packet (2.25 tsp) active dry yeast, 2 tsp salt, 1 tbsp sugar, and 3 tbsp olive oil. The water should be quite warm, but not hot (105-110 degrees F). Combine it all at once, mix it together until all the flour is consumed, knead it on a floured surface until it passes the windowpane test, split it into 4 parts and put it into oiled quart bags or containers to rise for a couple days in the refrigerator. The yield came out to 4 pies roughly 9″ across. It’s somewhere between this NY style dough recipe and this no-knead dough recipe. Two hours before I was ready to start baking, I took the dough out of the refrigerator, pulled it into balls with the gooier bottom parts tucked inside, floured the exterior, and set it in covered bowls to proof at room temperature. An hour before I was ready to bake, I started preheating the oven to 550 degrees F with the cast iron skillet inside. I was pleasantly surprised to find that no matter what previous seasoning and cooking had been done with the skillet, it didn’t smoke during the preheat. The dough stretched easier than any dough I’ve worked with before. Its elasticity amazed me, stretching to an almost transparent thinness without tearing. The first pie I planned to make simply by slipping the topped pizza off of my floured baking sheet into the skillet, which had been preheating at 550 degrees F for an hour. This proved quite difficult, on account of insufficient flour on the baking sheet. With Colleen steadying the sheet over the skillet, I attempted to coax the pizza into the skillet with the aid of two spatulas. It was a disaster. The pizza folded in half spilling cheese and sauce into the skillet. I quickly shut the oven, thinking at first maybe I could just let it cook out and at least we could salvage it as edible. I then reminded myself that burning cheese and sauce to the skillet would probably make the next three pizzas all the more difficult to bake. I removed the skillet from the oven, ditched the pizza in the trash, and set off the smoke alarm all in one go. The second attempt was not much better. I more liberally applied flour under the pizza and gave the sheet some shakes to make sure that the pizza would slide off amicably into the skillet. Despite these precautions, the pizza still flopped and folded. Pizza filling just about half of the pan. Perhaps the third time will be the charm. Fortunately this one was truly salvageable. Though it is hard to tell from the photograph, the pizza folded upward like a mountain range formed from the collision of tectonic plates. And all things considered, the pizza came out surprisingly well. The end product was definitely within the realm of the edible. Not only had the pizza folded when it was going into the pan, but the pan had probably cooled significantly after the first failed pizza (I have no thermometer that I could’ve checked with). 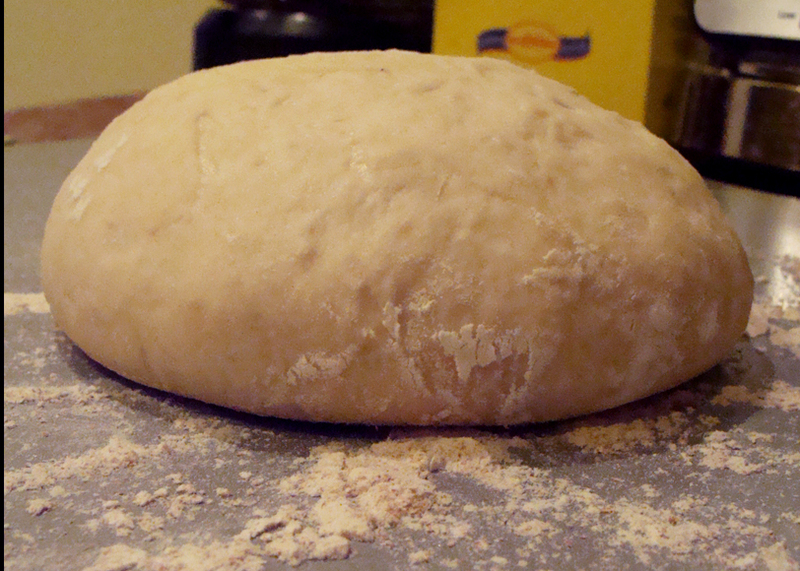 Yet even wit these short comings, the dough rose quite a bit more than my usual dough during the bake. 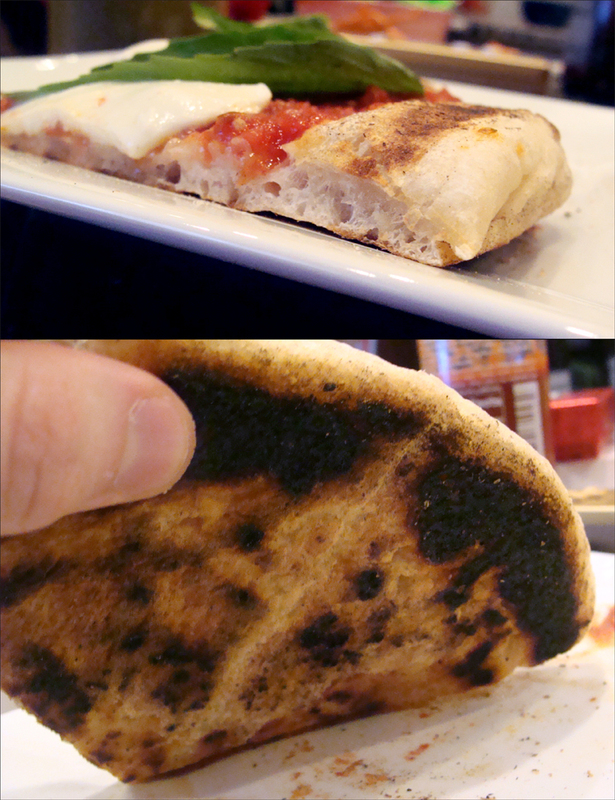 The crust was much truer to a commercial pizza crust, although it baked a uniform brown, only charring due to flour that had coated the surface and subsequently burned. Despite the appearance more closely matching springy crusts than my previous attempts, the eating experience itself left something to be desired. The crust’s exterior was not a fully satisfying crispy shell, the interior was a little more on the spongey side of chewy, and it was more dense than airy. My third attempt was based on preheating the skillet on the stove, sliding in the topped pizza, and then popping it under the broiler. This was maybe the most successful method of the night. Since the skillet was on the stove, I had easier access to the surface into which I was transferring the topped pizza. I managed to get the pizza from the cookie sheet to the skillet cleanly this time, and after a minute on the stove, I put it under the broiler. I would estimate that it spent 8 to 10 minutes under the broiler, but I was watching intently the whole time and never remember to check the clock. After the cheese was bubbled a bit and the crust was thoroughly browned, I brought the pizza back onto the stovetop for a minute or two more to finish the bottom. I don’t have any good shots of this pizza, but it was much like the first except with less rise, resulting in a denser crust with much of the same character, though just a bit more crispness (probably just due to a longer bake). My final attempt was entirely on the stovetop. I heated the skillet on the stove for quite awhile, and then dropped the untopped dough in. 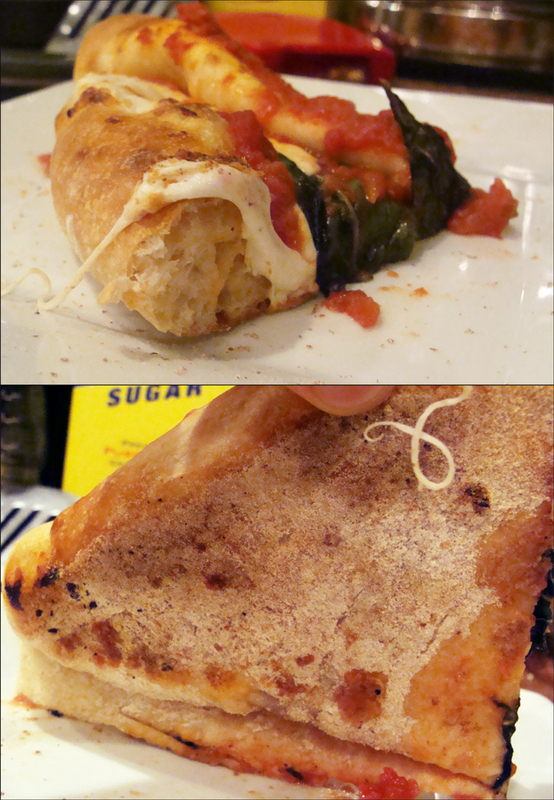 After about one or two minutes, there was a bit of smoke creeping out from under the dough. I had been peeking periodically under the bottom with a spatula, and I saw it was starting to brown and could feel that the bottom was started to become rigid, so I flipped it over. The top started to smoke more intensely and than the bottom, probably due to the excess of flour now deposited on the surface of the pan. Before I felt the top had adequately cooked, I fished the dough out of the pan onto my baking sheet. I topped the pizza, moved it back into the skillet, but had to remove it after just a minute because the smoke had become so intense that I was concerned about setting off the fire alarm again. Someone send for the fire department! This crust charred before it cooked. The toppings are as raw as when they first met the dough. As you can see, the crust was denser than when baked, and the char far more significant. However, the char was mostly again from burnt flour present from transferring the pizza from the baking sheet rather than char of the dough itself. This gave it bitter burnt character, but no extra crunch. In fact, this was perhaps the least cooked pizza of the three “successful” attempts, and despite perhaps looking the best out of all of them (except for the density of the crumb), was for me the least fun to eat. The results of all this experimentation and stress today could be summed up thusly in my view: the cast iron skillet is an interesting cooking surface that I’d like to revisit when I am better practiced at moving pizzas from surface to surface. With a properly preheated skillet, I’m confident that I could get crispier, airier crust that would exhibit more Neapolitan character. I’d like to even try again with stovetop pizza, despite the lack of rise in the dough and the difficult balancing charring with cooking. On the upside, the sauce and dough recipes were definite improvements. The sugar character was a bit heavy in the dough, so I will likely scale back on its presence (hopefully with no ill-effects in the fermentation and workability). The sauce was much more savory and complex than the relatively heavy-handedness of my usual sauce. This entry was posted in equipment, experiment, learning, pizza, recipes and tagged cast iron, narrative, no bake, skillet on February 6, 2013 by Dylan Bargteil.